Track your session statistics in real-time, and compare your progression to your historical statistics. Get rewarded for exemplary or extraordinary feats with Recursion in game achievements. View and compare your earned achievements online for individual sessions, or all time. Save your sessions to review in detail after play, or to share your friends. Perfect for linking from videos showing some extrodinary play, or for analyzing your performance over time. Inspired from legendary games like Unreal Tournament, Quake, Duke Nukem, and Mortal Kombat, the tracker includes optional in game vocals for both achievements and other moments. You can customize these vocals with any sound you choose, or replace them with one of many community created voice packs. A fully capable in game overlay is provided for viewing your session stats, kill history, and weapon history in real-time. Achievement notifications and optional heads up displays are also available with zero performance degradation. 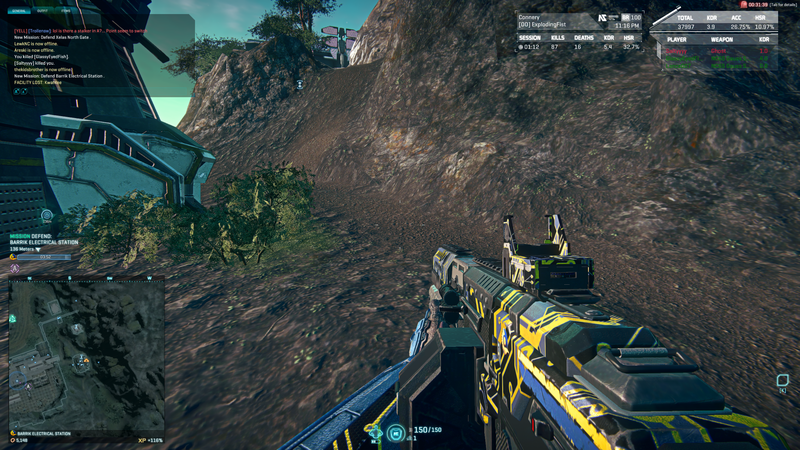 We have worked with DBG to ensure the client was safe for use with Planetside, for both the players and the servers. DBG has approved our third party client for use with PlanetSide 2. We love the Recursion Real Time Stat Tracker. It gives you some great info and even has support for in game overlays. As a PlanetSide 2 streamer, the Recursion Tracker is practically a necessity. It is one of the most awesome, innovative tools that I've ever used and my viewers absolutely love it. Not only does it provide extremely useful information in real-time, but it is also quite customizable, allowing it to fit anyone's taste, style, and preferences.